Silicone rubber heaters with wire-wound elements can provide uniform heating for unusual shapes or applications that have excessive flexing or vibration. These heaters are durable enough to survive repetitive bending without sacrificing the heater’s life or performance. Inside the heater is a wire wound element composed of high temperature resistance wire wound around a fiberglass cord. The fiberglass material provides added support, while still allowing for any expansion and contraction during the heating and cooling phases of heater operation. A CAD drawing of the heating element’s pattern is created to ensure maximum heat transfer and even heating. The design will also conform to the required size, shape, presence of holes/cutouts and any special heating profiles needed for the application. The completed element is sandwiched and vulcanized between two sheets of silicone rubber to form the body of the heater. In addition, the silicone rubber sheets are also fiberglass reinforced for improved tear resistance. Power lead wires, cord sets and/or thermostats are soldered to the heater windings and anchored in place with the vulcanization process. 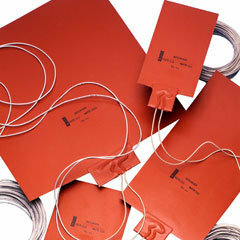 Flexible silicone heaters are often used in high moisture areas and outdoor environments with possible exposure to oils, solvents and radiation. Typical silicone heating applications may include condensation prevention, freeze protection, food services, heated platens, medical services, pipe heating, composite curing, semiconductor and aerospace industries. Used as drum heaters, they are also perfect for applying direct heat to barrels, conical shapes, cylinders or any other irregular shapes that are impossible to heat using other traditional electrical heating methods. Call Jobco Inc. today to order your silicone heater at 479-424-1300.